Last night’s dinner was this Creamy Potato Soup with a few hunks of chewy, homemade bread. Perfect for a cold, wintry day! And is that – dare I say it – BACON? 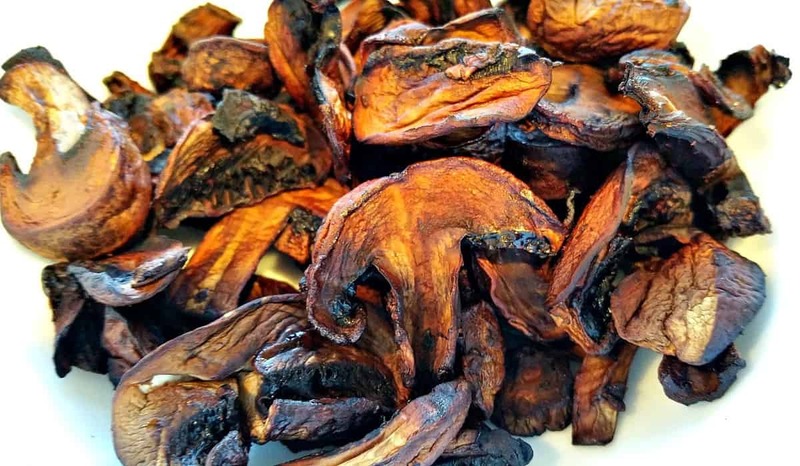 YES – a wonderfully sweet and smokey Mushroom Bacon! And it will rock your world. I had to take my truck in to get serviced yesterday, and as I was leafing through their supply of Food Magazines (what else) I found this Potato Soup Recipe from a Mrs. Shelly Woods of Blissfield, Michigan. So first of all – thank you, Shelly, for the inspiration! The recipe looked easy enough to convert, leave out the oil, sub a little Nutritional Yeast for the Velveeta Cheese…. This is how my mind works now…..I’m a certified food nerd! But when I saw the last two ingredients (ham and bacon) I honestly reached for another magazine thinking “Too bad, that looked pretty good”. Somewhere on the Internet, I remembered seeing Bacon made from……Mushrooms? I instantly googled it and voila! Mushroom Bacon! Sweet, smoky, maple flavored mushrooms! I knew right then and there I was going to HAVE to make this recipe after all! And let me stop right here and thank Kim from FitForTheJourney.com for her amazing Mushroom Bacon. I did modify the recipe a bit by leaving out the oil, but the flavor as she puts it really WAS ….the BOMB.COM! In fact, they were just coming out of the oven as my daughter was leaving for work last night, and one taste got an instant OMG from her – so you know it’s good! Prepare to have your world turned upside down. For being so good, this is ridiculously easy to make. You simply make a marinade of Tamari, Maple Syrup, and Liquid Smoke. Tamari is like Soy Sauce, only thicker, darker, and without any wheat. Whether you use Soy Sauce or Tamari – go for the Less Sodium kind. If you’re concerned with Liquid Smoke – Dr. Michael Greger has some excellent info on his site NutritionFacts.Org. As it turns out – there’s more of a concern if you’re actually smoking your foods compared to using liquid smoke. You can read his article here. Once the marinade is done, and the mushrooms rinsed and patted dry – dump both into a ziplock baggie and shake. You’ll want to make sure every single mushroom is thoroughly coated! Let that sit, turning it or tossing it every so often to keep things mixed, for at least 30 minutes….the longer the better. Then place the mushroom on a parchment lined cookie sheet and bake at 400° F for 20 – 30 minutes. After 20 minutes – check the ‘shrooms and nudge them around a bit to make sure they don’t stick or burn. Go ahead – take a taste – good huh? At this point, they are done – but you can leave them in longer to firm up even more if you want. They’ll just get smaller, more shriveled, and chewier. But…. NOTE: These will NOT get crispy! I baked, I used convection, I even tried the broiler – not gonna happen. They just shrivel up and burn. But that’s ok! It’s the FLAVOR we’re going after – not the texture. 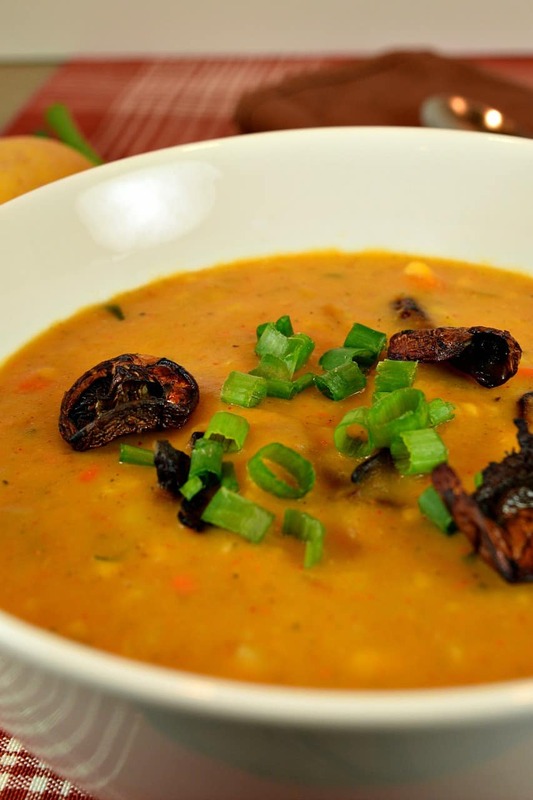 And the FLAVOR is AMAZING, especially in a hot mug of Creamy Potato Soup! The soup starts out with some cubed Yukon Golds, a few stalks of celery, carrots, onion, garlic, and 4 cups of Veggie Broth. It’s seasoned with a little salt and pepper, paprika, parsley, and poultry seasoning. You can optionally add some Nutritional Yeast if you want a cheesy flavor, or – as my friend Brandi Shine from TheVegan8.com suggests… a little Dill Pickle Juice. Once the veggies are soft, you can blend it with an immersion blender, or if you’re like me and don’t own one – ladle it a little at a time into a normal blender. 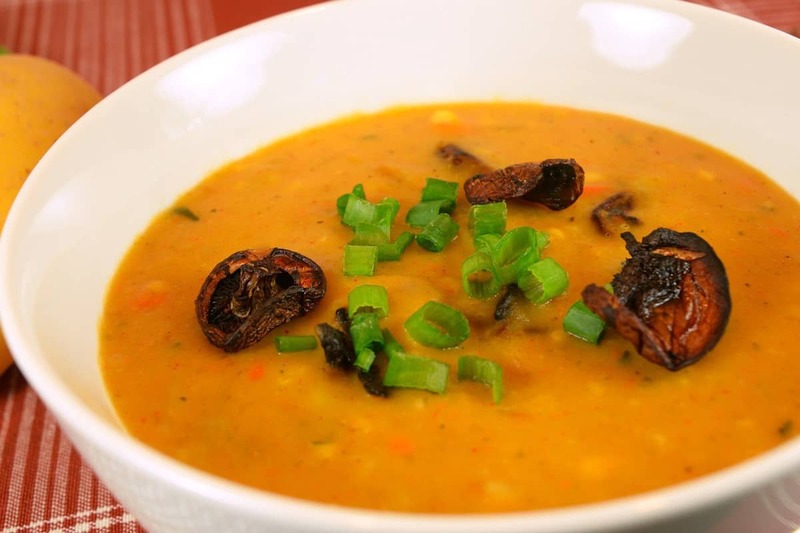 Finish off the soup with a cup of unsweetened Almond Milk and stir until it’s thick and creamy. If the soup is a little too watery, add a few Tablespoons of flour to your Almond Milk and whisk thoroughly before adding it to the soup. Garnish with chopped green onion, chives, and of course – the Mushroom Bacon. And for those of you who are snowed in? Stay warm, stay safe, and keep on cookin’ ! A Creamy Potato Soup, perfect for a cold, wintry day. 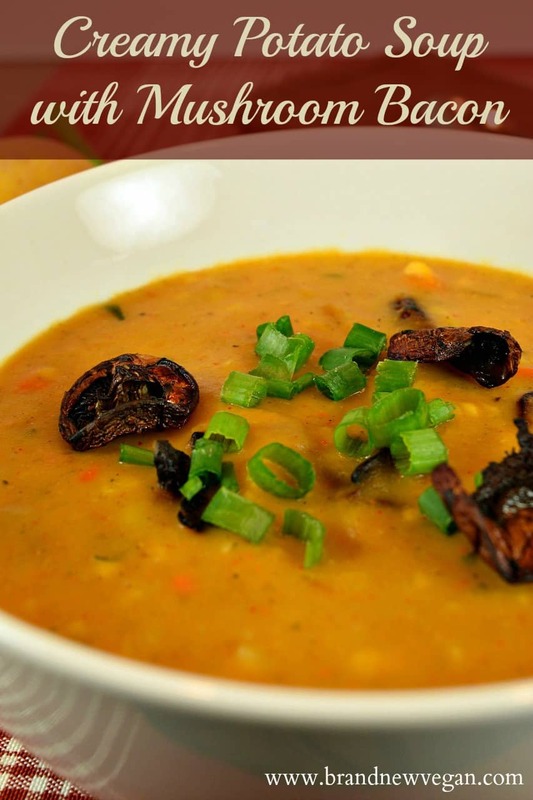 The addition of sweet and smoky Mushroom Bacon sends this soup over the top! Rinse and pat dry the mushrooms and add to a large sealable ziplock bag. i find the obscene dead animal flesh ads all over your site utterly repulsive and extremely nauseating. why do you accept ads from sun basket that feature dead animals? it’s so bad that i am considering to stop looking at your site. Each ad has a button that says REPORT THIS AD. All Meat & Dairy Ads should be turned off on my site, but some still slip through. Please report them to help make it easier to eliminate them for good.